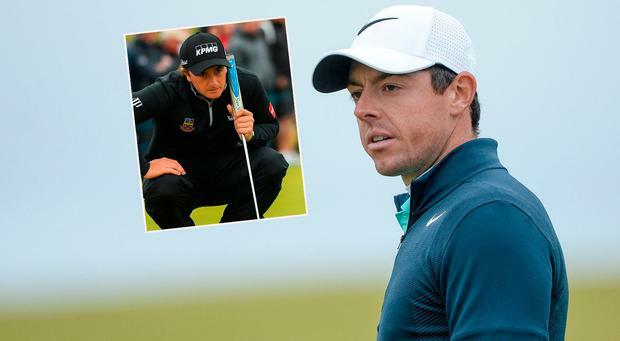 A deflated Rory McIlroy admitted he needs to eliminate "silly mistakes" from his game after missing the cut in the Dubai Duty Free Irish Open for the fourth time in five years. After labouring to an opening 72 on a day when 105 of the 156-strong field broke par, defending champion McIlroy could only add a second round of 73 at Portstewart Golf Club to finish one over par. The world number four's frustrations boiled over when he slammed his driver onto a tee marker following a poor drive on the seventh, his 16th hole of the day, but it was a clumsy double-bogey six on the next which sealed his fate. Playing partner Jon Rahm showed McIlroy how it was done in just his second regular European Tour event, the world number 11 carding a 67 to finish 12 under par, a shot behind halfway leaders Daniel Im and Benjamin Hebert. Paul Dunne and Padraig Harrington were the best of the Irish, finishing on -8 and -7 respectively to remain in contention. "I felt like I was battling well, two under through 13 and with another par five coming up," said McIlroy, who had started from the 10th and covered the back nine in 35 before picking up a shot on the fourth. "To bogey the par-three sixth took the wind out of my sails and to not birdie the seventh was the final nail in the coffin. I was a bit deflated. "It's disappointing because I felt like I was playing well coming into the week and I need to do some practice over the weekend and get ready for next week's Scottish Open. "My short game is not sharp enough and I'm making silly mistakes. I'm not being very efficient with my scoring which is making it difficult for myself. Maybe a little bit of course management as well. A couple of times I tried to go at pins I shouldn't have and paid the price. "It's the simple things I haven't been doing well. I can hit a five iron from 220 yards into the middle of the green, but I can't get it up and down from 30 feet. "I don't feel like there's so much wrong. I just have to keep at it and stay patient and keep practising. I feel like I'm working on the right things and need to stay on one path and not try to change ideas." McIlroy was playing just his ninth tournament of an injury-plagued season and admitted being the event host did not allow him to prepare as he usually would. But the 28-year-old added: "I don't want to make it an excuse because I played a lot of golf last week, I played well in the pro-am and I just did not get it together. "Even with being busy on Monday, Tuesday and Wednesday, I should be able to go out there and shoot two scores in the 60s standing on my head the way the conditions were. "It's been a really frustrating year. I need to play more. I feel like I'm starting on a run of doing that and I'm going to play a lot of events over the summer. But I really need to get my game in order if I want to challenge in them." Since turning professional less than a year ago, Rahm has claimed his first PGA Tour title and racked up a string of impressive performances, including finishing third and second in his first two World Golf Championship events. "If I was able to join them it would be absolutely amazing," Rahm said. "There's still a ton of golf to be played and hopefully I keep playing the same level I've been playing." England's Matthew Southgate and Oliver Fisher were a shot behind Rahm on 11 under alongside New Zealand's Ryan Fox, the son of former All Blacks fly-half Grant. And a late start on Saturday means Fox will be able to watch the final Test between New Zealand and the British and Irish Lions. "I'm going to be a bit biased here and think the Lions might have poked the bear a little bit," said Fox, who won in Northern Ireland on the Challenge Tour last season. "The All Blacks are generally pretty good about fronting up after they have been beaten and Eden Park is their fortress. "I might be the only one hoping for a home win but I'll be wearing my All Blacks jersey for sure." After McIlroy's exit there was more bad news for home fans when Graeme McDowell double-bogeyed the 18th to also miss the cut, while former Masters champion Danny Willett withdrew for the third time in his last five events with an ongoing back injury.